Gorenje Group's donation will allow students of the Iris Centre for Education, Rehabilitation, Inclusion and Counselling for the Blind and Partially Sighted to safely cook, which is an important step on their path to living an independent life. 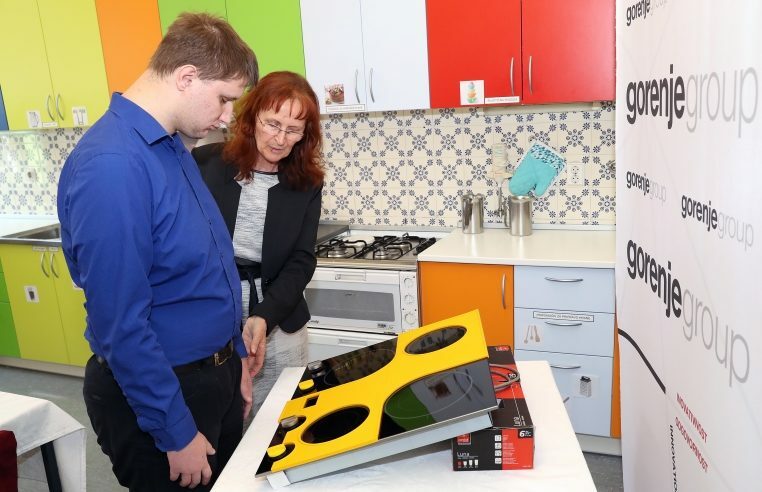 The cooking hob of our premium Atag brand, fitted with specially adapted silicone coating that allows safe use for the blind and visually impaired, is the first of its kind in Slovenia. Humanitarian efforts are an integral part of Gorenje Group's corporate social responsibility, and we are looking to assist those in need both in Slovenia and in other countries of our presence by donating appliances and funds, and by taking part in humanitarian projects. Over thirty children and youngsters with visual impairment are schooled at the Iris Centre (previously the Ljubljana Institute for Blind and Partially Sighted Youth). The blind and visually challenged students and pre-school children at other schools are accompanied by Iris mobile teachers. The Iris Centre also offers special know-how and training for all target groups: blind and visually challenged and their immediate and broad environment. To the joy of the Iris Centre students, Gorenje Group responded to an initiative by the Ljubljana Forum Lions Club and donated a special induction cooking hob of our premium Atag brand that can also be safely and simply operated, using special accessories, by the blind and visually impaired. "Although our students cannot see, they enjoy cooking very much as they prepare for independent life. Despite their great efforts and perseverance, the problem often lies in home appliances that are not sufficiently adapted to allow safe use,« stresses Katjuša Koprivnikar, director of the Iris Centre. "Fingertip burns can be critical for a person relying on reading the Braille script. Induction cooking hob, on the other hand, presents a major problem for a blind or visually impaired person as it is difficult to navigate and control without sight. To our great delight, Gorenje has found a solution and donated a cooking hob with an extra contrast silicone coating that allows safe use. To our knowledge, this is the first appliance of its kind in Slovenia, adapted for the blind in this way." Gorenje has collaborated for a number of years with institutes and organizations providing aid to individuals and families in need, like the Friends of Youth Association, Social Work Centres, the Red Cross, maternal homes and safe houses; these make sure our appliances end up in the right hands. In 2016, we worked with the Moste-Polje Friends of Youth Association to provide relief to 22 families in financial distress, and helped several societies and institutes like the Kamnik Centre of Education, Recovery, and Training, Iris Centre, Centre for Elderly Persons Notranje Gorice etc. We donated a total of 64 home appliances and 100,000 euro in funds. Working with a variety of non-government organizations, our sponsorships and donations are also aimed at co-shaping opportunities for quality education and leisure time activities for our youth. Iztok Šepec, Gorenje GSI managing director: "In Slovenia, Gorenje has enjoyed considerable trust for decades, and Gorenje appliances can be found in nearly every Slovenian home. Thus, such charitable activity is very important to us. We usually work as silent donors, as after all, what matters is to alleviate the most pressing distress. Working with the organizations familiar with the actual conditions allows us to channel the aid to those who really need it the most. Sadly, the needs are rising every year. Our goal is to help the weakest, i.e. families in social and financial distress."